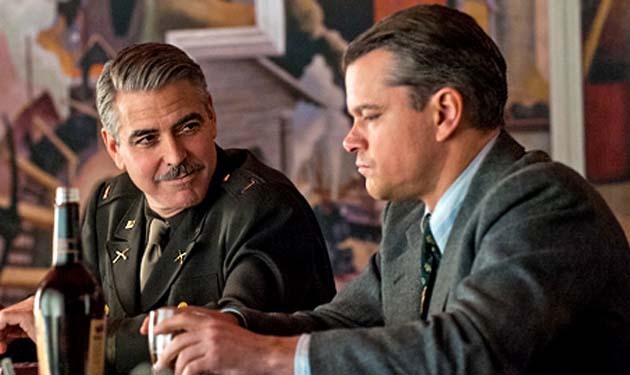 Cecil B. DeMille Award honoree George Clooney in The Monuments Men, with Matt Damon. Produced and written by Good Night, and Good Luck. collaborators George Clooney and Grant Heslov, and directed by Clooney, The Monuments Men is a World War II drama loosely based on Robert M. Edsel and Bret Witter's non-fiction book The Monuments Men: Allied Heroes, Nazi Thieves and the Greatest Treasure Hunt in History, about Allied groups' attempts to save artwork from the hands of the Nazis. Also in the cast: Jean Dujardin, Cate Blanchett, Bill Murray, John Goodman, Bob Balaban, and Hugh Bonneville. Between 1952, the year of the award's inception, and 1980, there were 11 such individuals – most of them honored during the 1950s. The recipients ranged from studio head Jack Warner and studio head/animator Walt Disney to directors-producers Alfred Hitchcock and Mervyn LeRoy, in addition to veteran director-producer Cecil B. DeMille himself back at the 1952 ceremony. George Clooney, who has directed a handful of movies – e.g., Good Night and Good Luck. (2005), for which he was nominated for a Best Director Academy Award, and last year's The Monuments Men – but who is best known for his work in front of the camera (see further below), will be handed the Cecil B. DeMille Award at the 2015 Golden Globes ceremony later this evening, Jan. 11. Last year's winner, multitasker Woody Allen, failed to show up to pick up his trophy. In his stead, Diane Keaton accepted the award and sang a little ditty in honor of her Sleeper, Annie Hall, and Manhattan co-star and director. Since George Clooney is expected to attend tonight's ceremony, that means there shouldn't be any little “homage ditty” unless the honoree decides to come up with one himself. Besides Good Night and Good Luck. and The Monuments Men, both of which George Clooney not only directed but also acted in, this year's Cecil B. DeMille Award recipient and former E.R. star has been seen in more than 40 feature films. Stephen Gaghan's political drama Syriana (2005), with Matt Damon and Christopher Plummer. For his thespian and weight-gaining efforts, Clooney took home that year's Best Supporting Actor Oscar. Tony Gilroy's socially conscious drama Michael Clayton (2007), with Tom Wilkinson and Tilda Swinton. Clooney won a number of U.S. critics awards and was shortlisted for the Best Actor Oscar. Jason Reitman's socially conscious critical fave Up in the Air (2009), opposite Vera Farmiga and Anna Kendrick. Clooney won more U.S. critics awards and was shortlisted for another Best Actor Oscar. Alexander Payne's equally well-received family comedy-drama The Descendants (2011), with Shailene Woodley. Clooney won even more U.S. critics awards and, for the third time, was shortlisted for a Best Actor Oscar. Alfonso Cuarón's prestige blockbuster Gravity (2013), co-starring Sandra Bullock. Here, Bullock was the one who received widespread critical praise and an Oscar nomination. Joel Schumacher's lambasted Batman & Robin (1997), with Clooney as the half of the title. Also in the cast: Chris O'Donnell, Uma Thurman, Arnold Schwarzenegger, and Alicia Silverstone. Terrence Malick's Best Picture Oscar nominee The Thin Red Line (1998), with Jim Caviezel and Sean Penn. David O. Russell's Three Kings (1999), a troubled production also featuring Mark Wahlberg and Ice Cube. Joel and Ethan Coen's O Brother Where Art Thou? (2000), with John Turturro and Holly Hunter. Wolfgang Petersen's The Perfect Storm (2000), with Mark Wahlberg and Diane Lane. Steven Soderbergh's Ocean's Eleven (2001), with Matt Damon, Brad Pitt, and Julia Roberts. The Ides of March (2011), a political drama also directed by Clooney, and featuring Ryan Gosling and Philip Seymour Hoffman. Jodie Foster's socially conscious thriller Money Monster, with Julia Roberts and Jack O'Connell. Brad Bird's sci-fier Tomorrowland, with Britt Robertson, Kathryn Hahn, and Judy Greer. Joel and Ethan Coen's ensemble comedy Hail, Caesar!, also featuring Channing Tatum, Ralph Fiennes, Scarlett Johansson, Tilda Swinton, Jonah Hill, Frances McDormand, and Christopher Lambert. George Clooney turns 54 next May 6. Judy Garland: the star of classics and near-classics such as The Wizard of Oz, Easter Parade, and A Star Is Born was one of the few female Cecil B. DeMille Award recipients of the last six-plus decades. Somewhat ironically, Mary Pickford and Gloria Swanson – two of cinema's biggest stars (Pickford was also a co-founder of United Artists) – never took home that particular award despite the fact that both starred for DeMille in the silent era. Below is the full list of Cecil B. DeMille Award recipients to date, in chronological order, beginning with the 1952 ceremony. Note: No Cecil B. DeMille Award was handed out at the 1976 and the 2008 Golden Globes ceremonies. Maurice Chevalier – the first actor to receive the award. Judy Garland – the first female recipient and, at age 39, the youngest recipient. Samuel Goldwyn, at age 93 the oldest recipient. No Cecil B. DeMille Award handed out. Sidney Poitier – the first black recipient. Sophia Loren – the first and to date only recipient to have enjoyed a major career in non-English-language films. Michael Douglas – 36 years after his father. Warren Beatty – 9 years after his sister. No Cecil B. DeMille Award handed out – and no Golden Globes ceremony – due to the Writers Guild of America strike. Meryl Streep – the first recipient to make an eloquent attack against a U.S. president-elect and the first recipient to be attacked in a tweet by a disgruntled U.S. president-elect. Oprah Winfrey – the first recipient without an extensive film career. Out of a total of 65 Cecil B. DeMille Award recipients to date (2018 update), a mere 15 have been women – all of them actresses, including two actresses-directors (Barbra Streisand, Jodie Foster) and one actress-producer-TV personality (Oprah Winfrey). In that regard, the Hollywood Foreign Press Association has quite a bit in common with the Academy of Motion Picture Arts and Sciences – and most other awards-giving groups and organizations. Image of Cecil B. DeMille Award recipient George Clooney in The Monuments Men with Matt Damon: Columbia Pictures / Fox 2000. Image of Cecil B. DeMille Award recipient Judy Garland: Metro-Goldwyn-Mayer publicity shot.